Here at ComicsAlliance, we've expressed some pretty strong feelings about "Grounded," the much-ballyhooed story arc where writer J. Michael Straczynski and artist Eddy Barrows sent Superman on a walk across America. The whole thing's been a train wreck since day one, with terrible characterization and a smarmy, condescending version of the Man of Steel combined with late comics, equally awful fill-ins, and Straczynski taking his own walk after finishing only four of his proposed twelve issues, all of which led us to name it the Worst Comic of 2010. But one element of the story that was glossed over in all this -- especially in the spin that touted Straczynski's departure from the book as being due to his focus on a line of graphic novels where newspaper editor Perry White didn't know what "active voice" meant -- was the arrival of writer Chris Roberson, who was tapped to finish the story based on Straczynski's notes. That is literally a page of Superman being faster than a speeding bullet, more powerful than a locomotive, and leaping a tall building in a single bound. We've seen Superman using his powers before in "Grounded," of course, most notably to humiliate a journalist, intimidate a bunch of aliens into doing what he says, and tell an old man he's having a heart attack without actually lifting a finger to help him. 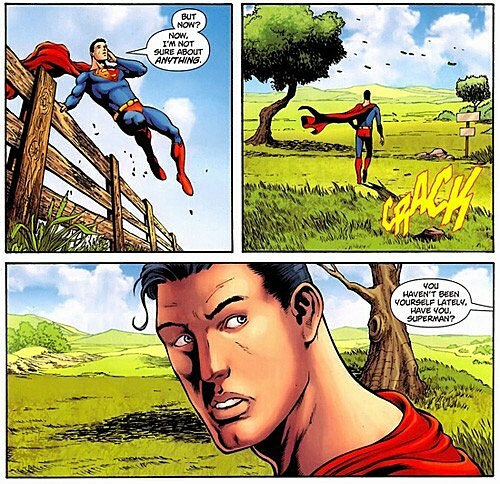 But this scene isn't Straczynski's smarmy super-bully, it's a look at -- for lack of a better term -- the real Superman. The character who uses his incredible abilities to help others, shown in a way that says "Superman" more than anything else. It might not have much of an impact on the rest of the events of the issue, but it certainly sets the tone for what happens by the end. 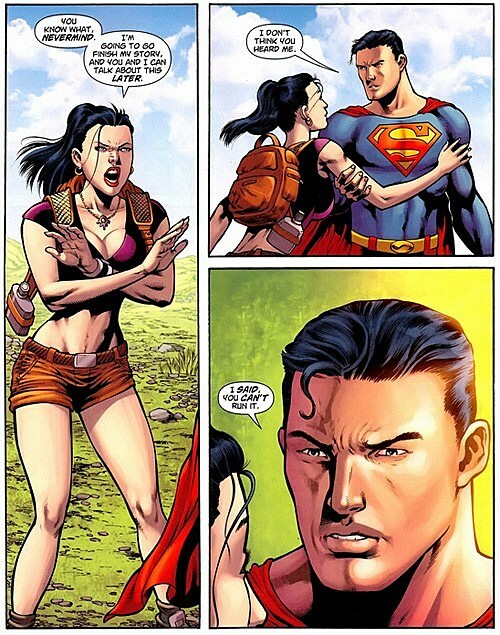 As to the story itself, there's been a lot of criticism leveled at Roberson from some corners of the Internet for showing a Superman that's wildly out of character, to the point where he lets environmental pollution slide and even goes so far as to physically intimidate Lois Lane into not reporting the story. And that's true -- that's exactly what happens in this issue. It's very similar to what Nick Spencer did in Jimmy Olsen, using an in-story source to comment on the metatextual problems with the character. 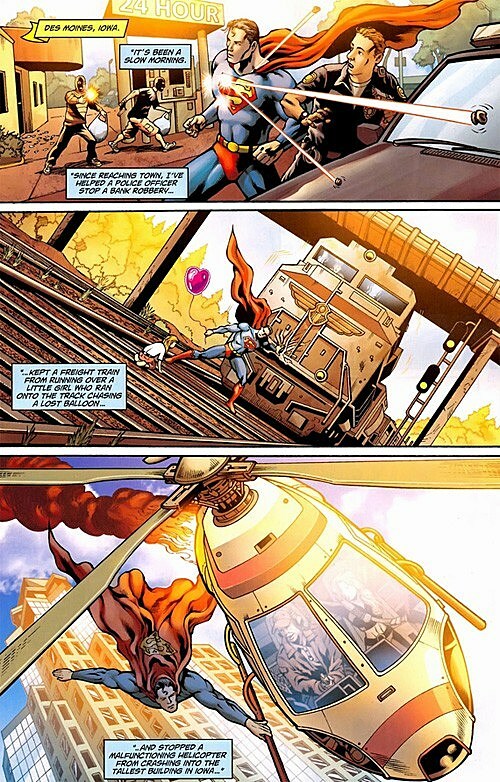 In that story, it was a matter of addressing the fact that Jimmy had been demoted from his starring role to a bland background character since Crisis on Infinite Earths by having Chloe Sullivan call him out for not being fun anymore, but here, someone straight up tells Superman that he hasn't been acting like Superman. I haven't seen the scripts, so I have no idea whether or not it was actually Straczynski's plan to eventually address the fact that he was writing Superman like a pretentious nitwit, but considering that he spends the first issue smarming at people who read like straw-man critics of Straczynski's script and lecturing them about Thoreau and the "hero box," I can't say I think it's likely. I've got to think that this attempt to reconcile his version of Superman with Straczynski's in an attempt to salvage any shred of a good idea that might be in those original scripts, this is all Roberson. Especially since the last page completely embraces the Cary Bates/Elliot S! Maggin era of the character. 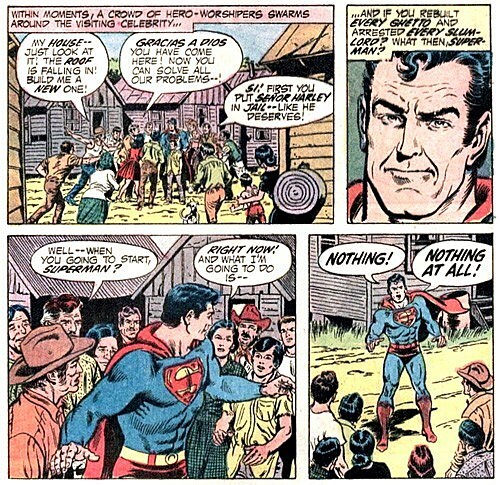 It's worth noting that Roberson has cited Maggin and Curt Swan's 1972 story "Must There Be a Superman" (Superman #247) as an influence. In that story, the Guardians of the Universe, in a fine example of their typical interstellar dicketry, decide that the presence of Superman on Earth is keeping humanity from flourishing to its full potential. 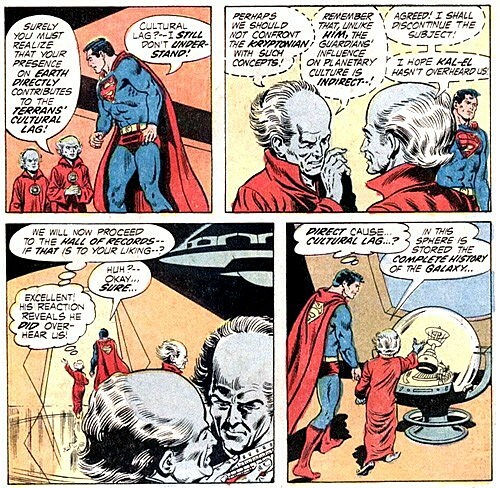 How exactly this is more responsible for messing with human culture than, say, giving three humans rings that can do virtually anything is never actually addressed, but in either case, it bothers Superman to the point where he spends the rest of the issue trying to deal with doubt and questioning his own actions. The important thing with this story, though, and the important contrast that it makes to "Grounded," is that Superman isn't worried about himself, he's worried about how his presence is affecting others, and if the good he does as Superman is outweighed by the bad he does at keeping humans from helping themselves. ...he stops an earthquake and rebuilds everyone's house even better than they were before. The lessons are clear: Humanity does need to stand up for itself and learn to solve its own problems, but at the same time, it's impossible for Superman to not help us to the best of his ability. Roberson and Straczynski set up a similar problem in last week's issue, albeit on a smaller scale. In both, Superman is presented with a situation where he has to decide if action or inaction will be the best course. But unlike Maggin's story, Superman can't decide. And this is the driving conflict that Roberson has rescued from "Grounded." Where Straczynski's version of Superman was a know-it-all who casually burned down drug dealers' houses and left a small child to tell them they'd been punk'd, Roberson's Superman is someone who should know the right thing to do but doesn't, something that he acknowledges and then sets out to fix. I wish we could've seen what Roberson would've done if he wasn't shackled by having to fix "Grounded," but it's pretty impressive to read one issue where he does his level best to do like Outkast and make a fat diamond out of dusty coal.